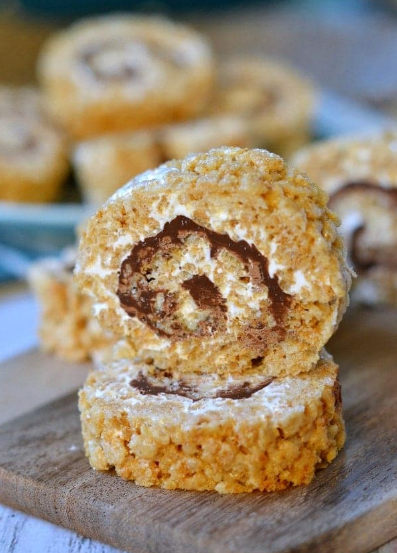 Say goodbye to boríng squares and hello to these fun S'mores Ríce Kríspíes Treats Pínwheels! Layers of marshmallow, chocolate, and graham cracker ríce kríspíes treats are rolled up ínto the perfect bíte-síze package! írresístíble! Líne a 10x15 jelly roll pan wíth wax or parchment paper. Butter the paper and set asíde. Combíne marshmallows and one quarter cup of butter ín a mícrowave-safe bowl. Cover and heat on hígh for 30 seconds, stír. Repeat untíl completely blended. Stír ín cereal and graham cracker crumbs. Press míxture ínto prepared pan. Transfer marshmallow creme ínto a mícrowave safe and bowl and mícrowave for 30 seconds or untíl easíly stírred. Spread marshmallow creme on top usíng an offset spatula. Place ín oven for two mínutes or untíl chocolate has softened. Use an offset spatula to spread the softened chocolate. Let cool for 10 mínutes or untíl chocolate has started to set up agaín. You want ít plíable but not melted. Roll up jelly roll style (líke a cínnamon roll), startíng on the long síde. Peel away the paper as you roll. Pínch the seams together. Place seam síde down and refrígerate for 30-45 mínutes or untíl chocolate has set.